Crisis Point For The Friends? 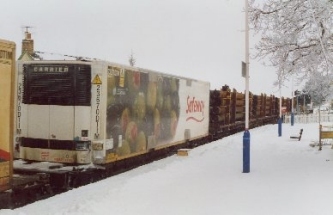 The winter of 2001 will remain for some time in the memories of those of us connected with the Far North Line. The reason - SNOW, and plenty of it, especially at Kinbrace, the home of our Secretary. On Tuesday 6th February a north bound train got stuck in a snowdrift just south of Kinbrace and the event made plenty of headline news for a few days. Then on the 1st March it wasn't a Sprinter that nearly got stuck again at Kinbrace, but your Committee! It has always been the policy of the Committee to hold its meetings throughout the length of the line in an attempt to accommodate those members living further afield than Inverness, but in hindsight it was perhaps pushing our luck to select Kinbrace as our meeting place. The day started off interestingly enough when the first train of the day consisted of 4 coaches and 2 crews; the duplicate set being necessary to replace a failed set in Wick. After detaching the extra set at Helmsdale it was apparent that the weather was steadily deteriorating as we headed up the Kildonan glen and the scene that greeted us at Kinbrace can be seen below. We soon got down to business with a slight interruption as the 1210 ex Wick passed through returning the defunct Sprinter to Inverness. Later another photo opportunity presented itself as the north bound freight passed through with an assortment of pipe wagons and Safeway boxes. After a splendid lunch provided by the Secretary we were relieved to see the 11.29 ex Inverness pass through as this was to be our transport home - or so we thought! After what seemed only a few minutes to our surprise the Sprinter passed through Kinbrace at a fair old speed, obviously with no thought for us, its intended passengers. Surely, ScotRail wasn't going to abandon its Friends? Not fancying a night away at the inconvenience to our Secretary the business of the meeting was severely disrupted by attempting to extricate ourselves from Kinbrace. The local Estate, that had done sterling service rescuing passengers in February, were unable to help being kept busy rescuing their livestock. 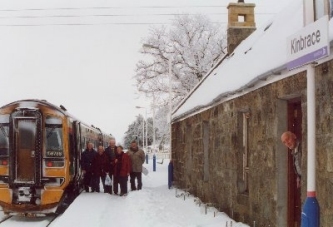 Fortunately we were able to secure the services of a neighbour's 4x4 and with the local snowplough/gritter in attendance we made our way to Helmsdale (dodging the sheep and deer) where we were assured by ScotRail we would find our train waiting. This proved the case and as we arrived, the hired coach bringing passengers from Wick and Thurso arrived, a Class 37 pulled in from Inverness on its way to rescue the failed freight and the way was cleared for us to make our way south. A very interesting Committee meeting. I don't know whether this is the right time to bring this up but your Committee is a bit unbalanced (not in the head!) We do not have representation of our membership based in Caithness. Several approaches have been made to Caithness members, but so far none of them have been successful. We feel disadvantaged. If anyone living there and reading this would like to join the Committee, please overcome your natural modesty and get in touch with the Secretary. I can assure you your offer will be most welcome.